In case you don’t read my Events Page. It’s no secret that self-publishing has taken off in a big way in recent years. A lot of books are self-published daily, some say it’s due to the easiness – uploading a book to one of many POD sites and hoping for the best – and indie writers losing faith in mainstream publishing. There are arguments for and against self-publishing and there are those who still stigmatise the industry as being nothing more than vanity at its worst. When I was younger I did not believe I would self-publish a book. Completely against the idea, I listened to everything Writing Magazine said – I would not read self-published books, would not entertain the idea that they could possibly be good. I’m not sure when I changed my mind. 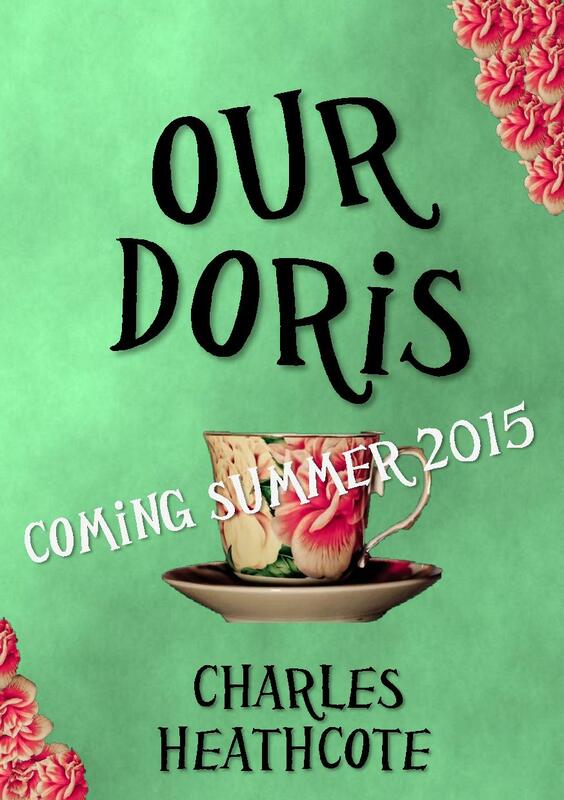 When I began to write Our Doris I did not plan on anyone else in the world seeing them. During writing bursts at the Macclesfield Creative Writing Group, I would scribble down a short anecdote about Doris and forget about it until the next week. 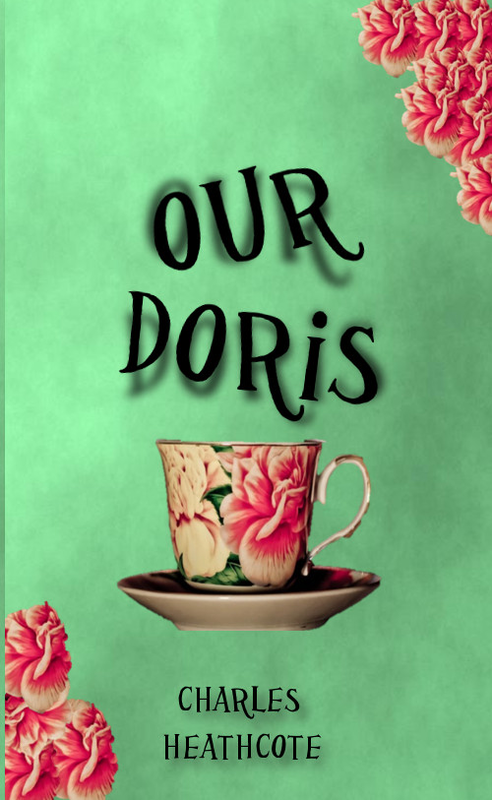 Over time the stories grew, characters appeared, characters stayed and folk commented that they’d like to see a book about Doris. The group have a few writers who have self-published their own books, purchasing ISBNs from Nielsens and using printers to get their books out there. I’ve helped create two anthologies that we’ve sold to local people. I had a conversation with Margaret Holbrook, local indie author, and the idea to create a book of monologues grew from there. I would ten monologues to a set amount of words, similar to a radio series, in that each should take half an hour to be performed. I didn’t think there would be any place in mainstream publishing for the book and had grown accustomed to the idea of doing all the work myself. I’m a bit possessive of my work so this meant I could do the cover design and book design myself. I knew that the work would most likely be difficult – I’d have to ask book shops if they would take my book and although Waterstones will accept self-published books you have to go through Gardners. I had the backlog of material to go through and thought I could spend a month on the book, bring it out and hope the writers’ group would purchase copies. After that I envisaged nothing more happening. With Nielsens you have to buy ten ISBNs right off the bat, and I thought I’ve got about sixty years left on the planet, I could use them in that time. I’ve researched my options – considered posting the monologues to this blog – but I like the idea of a physical book. As I finish the book, I hope to arrange some readings and have spoken to a librarian already about possibly launching my book at their library. There’s a lot going on; I imagine it’s going to get busier because I bought a diary – I’ve not made many appointments yet – only the odd open mic, but I’m getting there. 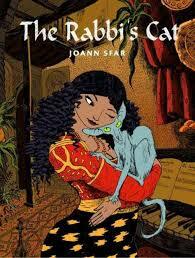 The Rabbi’s Cat by Joann Sfar is a graphic novel – no it is the graphic novel – we’ll get to that in the next paragraph. The graphic novel tells the story of a cat who eats a parrot and gains the ability to speak. The first thing the cat does with his ability to speak? He lies. And it is this that made me fall in love with what can only be described as one of the most beautiful books I have read this year. I love this graphic novel. I love everything about it. I love the characters and the artwork and the storylines. I love the religious debates between the cat and the rabbi. This book is forever imprinted on my heart as one of the greatest books I have or will ever read and I cannot look forward to getting the second – I need it in my life. Okay, so I might be mildly obsessed with this graphic novel. I’m going to begin by saying that I knew nothing about The Rabbi’s Cat before I discovered it at my local library. Therefore I don’t have all the information about the series or how the books work out – there could be an order, there could be other books that I don’t know about. All I do know is that I thought it’ll be a humorous book to read. I gave The Rabbi’s Cat my full attention. I thought I’d be able to read it before bed. I couldn’t. I put the book down in order to be fully awake and acknowledge every single panel and thought process the cat went through. The cat takes religious debates and mentions science whilst also giving insight into the world he inhabits. He and the rabbi are perfect foils for one another, joined together in their love of the rabbi’s daughter Zlabya. The Rabbi’s Cat is a great thing to read in 2014 because it teaches you about a world you might not have known about otherwise. I certainly didn’t. I didn’t know anything about Judaism or it’s beliefs, but it did not matter because the book taught me – it doesn’t preach – it offers a great debate for people who might struggle with religion but it’s not a religious book. It is a book that is pressed firmly into my mind. It makes me want to go out and read more graphic novels – I’m already searching for more works by Sfar but I also want to read graphic novels as an actual medium of telling stories. I’m not going to lie and pretend that there hasn’t been stigma against graphic novels in the past. There has and still is. Folk feel they have to excuse why they read Maus – a book I also need to read. I am just unable to express in words how much this graphic novel means to me. To talk about it makes me stutter – it makes me feel alive with words and joy and all of the things a good book does for you. Please, if you read any book in your life, read this. If you dislike reading but want to read more – graphic novels are a great starting point. If you have any recommendations of graphic novels let me know. Are you Afraid of the Words? At the moment, folk are being taught that in order for them to succeed they need to be scared of creating work. If you are to write a novel then you must fear each word you put down, you must be petrified of your characters, and you must worry about every thought subsequent readers have of the work. This is the only way you will succeed as a writer. It is all right to feel anxious. I have had many issues in the past with my own writing. I have documented them here, but I believe that we shouldn’t tell writers that they must be anxious because that’s what writers do – sit at home, feeling anxious and watching re-runs of Jeremy Kyle with a carton of Tropicana and a half-eaten custard cream. We should tell writers how it feels to have completed a novel; remind them of the glow and the sense of worth. It is easy enough for writers to give up, without other people making them feel there’s no other option. I have left plenty of projects behind – years ago if you were to read this blog, you’d find plenty of posts about projects that never saw the light of day or were never completed. When you’re writing it can be incredibly easy to forget why you started writing your work in the first place. Ideas are easy, it’s the execution that’s difficult, but that doesn’t mean you shouldn’t feel passion for the work. It doesn’t mean you should be scared of writing. It means you have to work harder to achieve something. As a writer, you will be seen as lazy, you will be seen as a fool, and you’ll often be asked why. It will be brilliant. You are not lazy, you are determined. It would be foolish to leave the idea floundering in your mind, and not regret writing the book when it’s too late. And more often than not you’re writing because it hurts not to – there will be physical pain in your chest, and unfathomable sadness. You should not be scared to write. If you are passionate enough about a story that’s all you need. Throw all past ideas of difficulty out of your mind and write one word at a time. If you write just five hundred words a day, you can have fifty thousand words in three months. If you plot your novels that’s great, if you don’t plot that’s great as well. There is no right way to write. All writers have their own idiosyncrasies when it comes to how they write – it’s the best way to prove you’re individual. Make a promise with yourself to complete your novel – the time span doesn’t matter. All that matters is finishing. It can be rough around the edges, it can be startlingly bad; it will be your novel, they will be your words and you will feel brilliant. It isn’t often you receive a letter from the dead. But Vianne is completely unprepared for what she finds there. Women veiled in black, the scent of spices and peppermint tea, and there, on the bank of the river Tannes, facing the square little tower of the church of Saint-Jerôme like a piece on a chessboard – slender, bone-white and crowned with a silver crescent moon – a minaret. Christmas Day 2007 – A few months earlier I discovered Joanne Harris’s Runemarks at my local WHSmith and asked for it. On Christmas Day, after finding I had been given this book, I also found another book The Lollipop Shoes, and as with all fifteen year old boys proceeded to tell my mother how I would not like this book as it was meant for adult women. Either way, I proceeded to read Runemarks – I only ever read fantasy novels – and forgot about the second book. Until I’d finished my GCSE exams. I remember being sat in my room, wondering what to do. I looked across at my bookcase and the book seemed to call to me. It was at that moment I decided I needed to at least give the book a chance. I opened The Lollipop Shoes and from the first line, ‘It is a relatively little-known fact that, over the course of a single year, about twenty million letters are delivered to the dead.’ I was hooked. Books for adults weren’t meant to start this way, they were meant to bore you with backstory. For some reason, my years at school reading Classic English Literature had given me this idea that all books were written in the same manner that read as though you were trying to walk through treacle. This book introduced to me to Vianne Rocher and the Chocolat world. I hadn’t read the first book, I didn’t know it existed until I was some way through the book and realised there were past references I didn’t know about. These didn’t matter though, the book enthralled me – I quickly acquired the majority of Joanne Harris’s books. When I became a volunteer at Age UK, I found that you will often find Chocolat at charity shops. At the time, I started to ‘save’ her books. Often the copies of Joanne Harris’s books would have badly-creased spines; this meant they were destined for the skip. As soon as I heard this, I asked to have the books. Chocolat, Five Quarters of the Orange and Blackberry Wine are the three books I have that I purchased from Waterstones. I have found The French Kitchen at Age UK and use it for recipes – I like that there is a story behind the recipes. I don’t have Sleep, Pale Sister, and still have to read a few of the books I’ve found, but The Lollipop Shoes cemented my admiration of Joanne Harris’s writing. That enamoured that when I went to sixth form and discovered we could write a piece of transformational writing – glorified fan fiction – I immediately chose to write about The Lollipop Shoes. In the book I wondered about the relationship between Vianne and her mother – I even contacted the author through MySpace to tell her about the project. I wrote from the perspective of Vianne’s mother and was told that I write like a twenty-first century woman. When I discovered that the author would be returning to the world of Chocolat in her latest book, Peaches for Monsieur le Curé I was ecstatic. In Peaches, Harris returns Vianne Rocher to Lansquenet – a world changed from when we met the characters in Chocolat. With the addition of the Muslim faith, the reader is once again presented a world of two worlds supposedly at war with one another. After a very long introduction, I will review the book. Firstly, I want to say that Peaches doesn’t read like your everyday sequel. In fact, it is more of a reunion. The reader is presented with a story that we have seen before – a war between two worlds, that when we get to the core of it, is actually the war between a parent and their child. In Chocolat, the war we felt was between Vianne and Reynaud. In The Lollipop Shoes, the war mirrored the war in Peaches, in that we felt the war was between two characters Vianne and Zozie, when in fact Vianne was at war with herself. In this ‘sequel’ Harris uses the motif of the peach. On the cover we are shown a wasp crawling over the stone of a peach, reminiscent of a line within the novel, ‘The Autan wind is merciless; already, the ground at the foot of the tree was covered in windfalls. Leave them more than a minute and the wasps will start to attack them.’ Here, the reader begins to think that the mysterious Inés Bencharki is the wasp on the stone of this peach – yet we’re often told that Inés is a scorpion, her story related to a folktale about a scorpion and a buffalo. This story is used to foreshadow the ending, yet the reader does not realise this until after the climax. It is this climax that also causes the reader to realise that Harris has presented us with another twist. Now, we question who is the scorpion and who is the buffalo. Who is the wasp on the stone of this peach? These questions are presented in such a subtle manner, that you can’t help but applaud Harris’s mastery of her storyline. This is a truly multi-layered storyline. Yes, this is a novel about war, but it is also a novel about faith. Reynaud calls his own faith into question when he is practically excommunicated from the community due to his way of preaching. In this novel, he is a viewpoint character, and the reader gets insight into the way he thinks. He is a man of incredible faith – who knows nothing else. His life is built on his faith and without it he is at war with himself – does he continue to go on as he does: a shell of a man held in contempt by those around him, or does he leave and try to build a new life elsewhere? Vianne’s faith in her ‘magic’ is called into question as well. This book doesn’t feature as much ‘magic’ as the last two books, yet it is still a large part of Vianne’s life. She has built her life around her ability to help those around her – in this book she gains a better awareness of what her departure in Chocolat has caused. Even though she thinks she has helped to change people’s lives for the better, she discovers that things haven’t changed so much as they have been covered up. We even find a war between two factions of the Muslims who inhabit Les Marauds. An old man Mahjoubi believes that their faith shouldn’t be as stringent as they have been in the past, whilst his son believes that their women should wear niqab or hijab – for they tempt the men; he believes that following the old system will create a better world for them to live in. Here, we are presented with the three main features of war: war between parent and child, war between faiths, and war between the old and the new. An evocative example of showing over telling that makes this writer awe at Harris’s ability to show the stagnant state of affairs. The repetition of the ‘and’ to emphasise how Vianne feels about the world she now inhabits. This is the world we are presented with at the start of the novel, and this is when, as the reader, you pray for change as well. You can’t wait for Vianne to return to Lansquenet. Harris’s use of punctuation is also something writers should stop and take a look at. Reading Peaches made me appreciate the use of dashes – how they are used to emphasise how rapid our thoughts come, to cut off thoughts and sentences, to move the story along. There’s the semi-colon that is used at one point in such a quick succession, that it becomes almost poetic in its use. The dashes help to show the reader that we are often being shown the character’s internal monologue. We aren’t seeing the world through anyone else’s eyes but Vianne’s and Reynaud’s – they have their own way of thinking, and as the story progresses, the reader gains an appreciation of this way of thinking. Yet, when we are presented with the cultural differences it is almost as if Harris is holding a mirror up to our own beliefs. Do we, as readers, believe that there is any difference in the characters? Do we often see the culture over the character? If you met Mahjoubi in the street – would you treat him as you would a person of the same race? Or would you think he would not understand the nuances of your culture as much as he does his own? As a reader, I didn’t know how to answer these questions. I know that when I’m working the till at the charity shop I find myself enunciating syllables to the Muslim families that come in – I do have a muffled voice – and often chastise myself for my own in-built racism. Yet, I find myself getting annoyed that I am unable to find some middle ground where we can understand one another fully. Does this in itself not show that I am more like Caro than Vianne? I believe that I have accepted these members of the community, when in fact I treat them as though they are foreigners not friends. This is something we are taught in Primary School; that although there are different religious cultures we still have to pray to God in every morning assembly, regardless of faith. We tell our children to serve him, and that other cultures are different, that these differences are wrong. Only as we get older do we realise that there is place for different cultures in society. As a society, can we not accept these other cultures rather than believe we do because we eat cous-cous? Here we have Harris teaching us about the language of food. All societies are able to communicate through their love of food. Harris’s descriptions often use tastes to describe certain aspects of a person, ‘espresso eyes’, so that any reader can better understand this character. As well as showing characters that talk to one another with food – Vianne’s chocolates, Zahra’s mint tea – through her descriptions of character’s appearance with food, Harris communicates that all her readers, regardless of language, will understand. After the climax, we begin to see a reintegration of characters travelling between the two worlds – a character goes downstairs and discovers that food has been left for them. When this happens, the reader is able to relax after the tension that has spurred them on throughout the novel. Community spirit begins to return to Lansquenet, and the reader is left wondering whether Vianne will remain in Lansquenet or return to Paris – a question that leaves us on tenterhooks. I applaud the author for this novel. Joanne Harris is a writer who is often under-rated. If you unpick her novels, and look at the sheer mastery of threads, you can understand why she is one of the authors I admire. I feel like I should end this review on a cooking metaphor, but I can’t think of one that would do any justice. Here we have a novel and an author who deserve to be read. We have timeless themes and characters – as Harris teaches us, peaches represent eternal life, and this book represents the cyclical idea that sometimes to move forward we must go back.